Wrapping paper is big business. This time of year stores tout it in their displays, tempting us to wrap our gifts in shiny, colorful, and expensive papers. I’m always amused at the cost of gift wrap after the holidays, it’s 50 percent off. Nice. 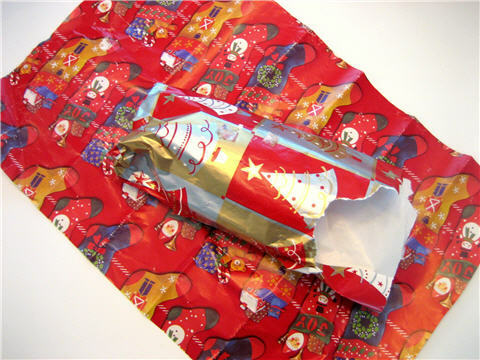 Anyprettypaper, after years of spending big bucks on wrapping presents, I’ve decided to put a wrap on this needless expense. This year I’m getting creative, green, and frugal when wrapping presents for loved ones. Besides, I’d rather keep the pretty paper in the forest, on the trees. 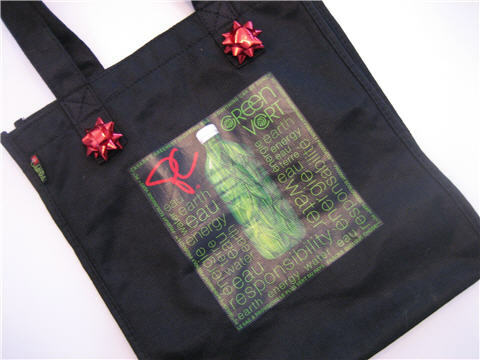 Many readers have mentioned they are wrapping their gifts in reusable shopping bags this year. The readers are smart. Reusable shopping bags reduce the number of plastic bags released into our environment and provide an awesome alternative to gift wrap. Give a gift and give it in a reusable bag. There are many colorful reusable bags to choose from nowadays. Here’s a frugal Reusable Grocery Tote Bag 6 Combo Pack ($9.95 Amazon) in multiple colors. Split the pack and you’ve got 6 ways to wrap gifts. 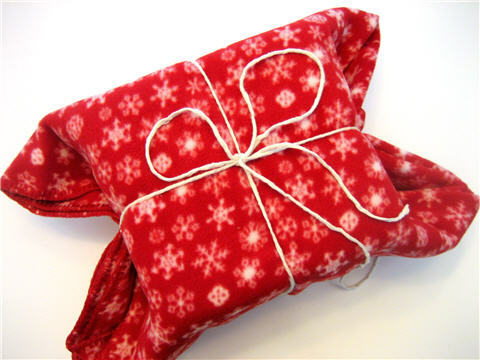 If you’ve got a new parent on your gift list, try swaddling holiday baby presents in a receiving blanket. Very creative, and very helpful to new moms and dads. Who doesn’t have a few cookie tins laying around the house? Get gifty this year by placing presents in a simple can. 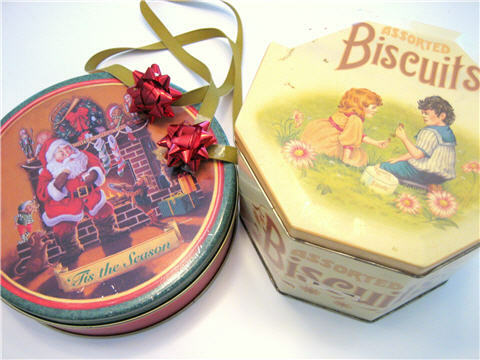 Vintage cookie tins make especially nifty gifties. 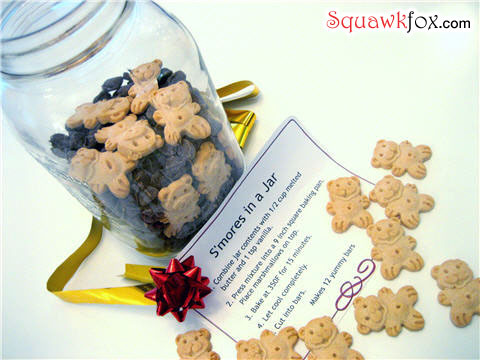 Give a homemade gift in a jar. 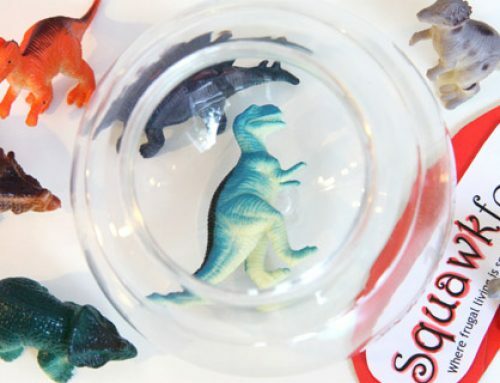 If you’re not into giving food then place toys or other smaller items in a jar, then put a lid on it. 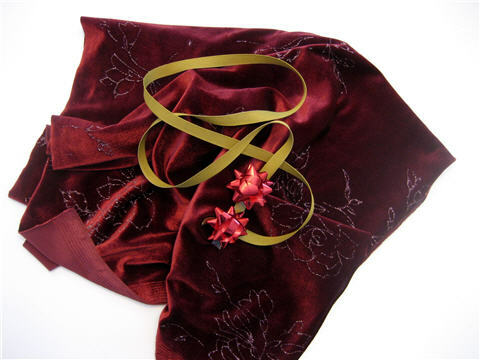 Use leftover sewing notions to drape gifts in fabric. Add some ribbon and you’re good to give. Re-gift those gift bags and see if you get yours back next year. Snicker. Giving a warm winter hat with a pair of gloves? Tie it in a scarf to complete the set! 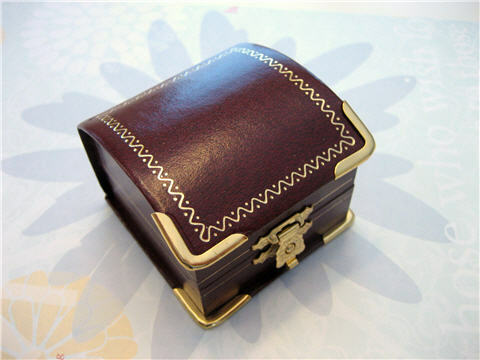 If you’re giving something small, try placing it in an old ring box. So pretty. 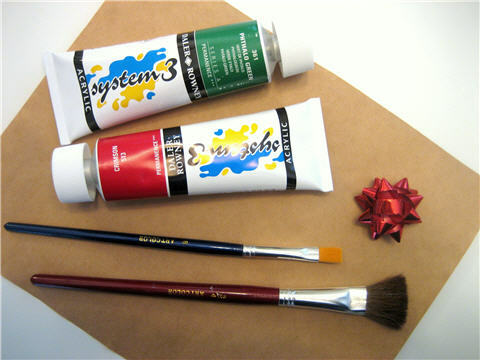 Use your wallpaper scraps to dress up holiday gifts. 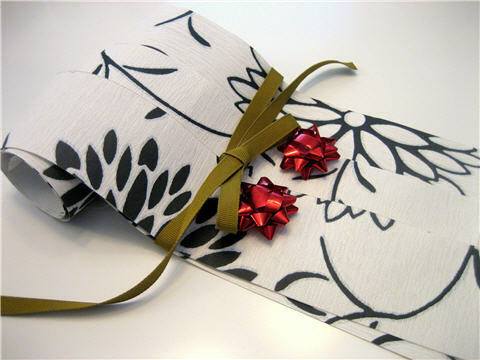 Get some crinkled gift paper and wrinkle it some more. The extra folds and wrinkles give it an intentionally disheveled feel. Go postal with some simple brown postage paper and add some painted stripes. Get the kids to draw designs with markers, paints, or crayons. For stripes, I often paint random and uneven lines to give it the homemade look. If you’re into perfection, here’s how to paint perfect stripes. There are so many ways to put a wrap on gift paper. Got any other gift wrapping ways to add to this list? Your alternatives to the wrapping paper certainly look very yummy themselves!! Love your list! 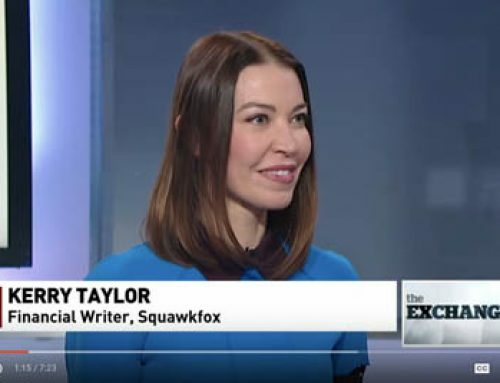 I love this article! I’m a huge fan of using anything other than wrapping paper! I think that whole business is a crock. I mean, considering how much they charge and then you just throw it away? Ugh. Along the lines of your parcel paper – you can do the same thing with paper grocery bags as well. My mom has a bunch of holiday boxes that are reuseable, they’re printing and they nest inside each other for storage. She uses them every year for gift wrapping. She’s had them for 7 years and they look as good as new. 1. When I cut and wrap meat, it’s in saran wrap, and then butcher paper. Usually I save that clean butcher paper to reuse again, and it works well for wrapping. Use some Christmasy rubber stamps and stamp it up in a Holiday design! 3. Also at garage sales, find fabrics in Christmas prints or colors. I sewed drawstring bags for the grandkids’ gifts. I just have my kids save the bags and return to me for gift giving the next year. This also works for Birthdays for grandkids. And they are reusable year after year! 4. Cardboard boxes – both shipping boxes and cereal or oatmeal boxes work great also. 5. And a 2nd on the cookie tins. I find mine at garage sales, and especially like finding the large ones that popcorn or something similar has come in. Usually they are 10-25 cents, and can be used for years. Mine go in the attic, nested inside one another, for storage. 6. Backpacks, totes, cloth advertising bags – all found at garage sales – a lot of times free! Great ideas. Last year I didn’t buy any gift wrap and just used things I already had. This year I’m wrapping all my packages in fabric. It’s amazing how clever you can be when you don’t just go out and buy something – works the same way with the gifts themselves! *Maps, especially if the present has a travel theme to it. Best of all, if you’re a AAA member, maps are free at local offices. If not, check out your local Tourist/Visitor’s office since they usually have maps for free as well. Thanks for commenting on my site. You have a very cool blog here! I loved your About Me section. Great ideas! I always use gift bags other people had given me or else cloth bags. Never would have thought of using a shopping bag though; that’s very innovative. Great ideas. I’m not a fan of wrapping paper because it always ends up in the recycling at the end of the day anyway (if it IS recyclable). I love the idea of wrapping things in reusable shopping bags. They aren’t pretty but you can get them for under a dollar at Walmart. You can always dress them up a bit by painting them or stamping them. I have been recycling gift bags for years. If the gift will fit in a bag, that’s what I use as I have quite a collection. I sew drawstring bags out of Christmas fabric I buy on sale after Christmas. I invite the recipients to re-use the bags for future gift-giving. I actually LOVE wrapping in magazines and newspapers!! I use http://www.giftzip.com to give gift cards electronically or print them on recycled paper. 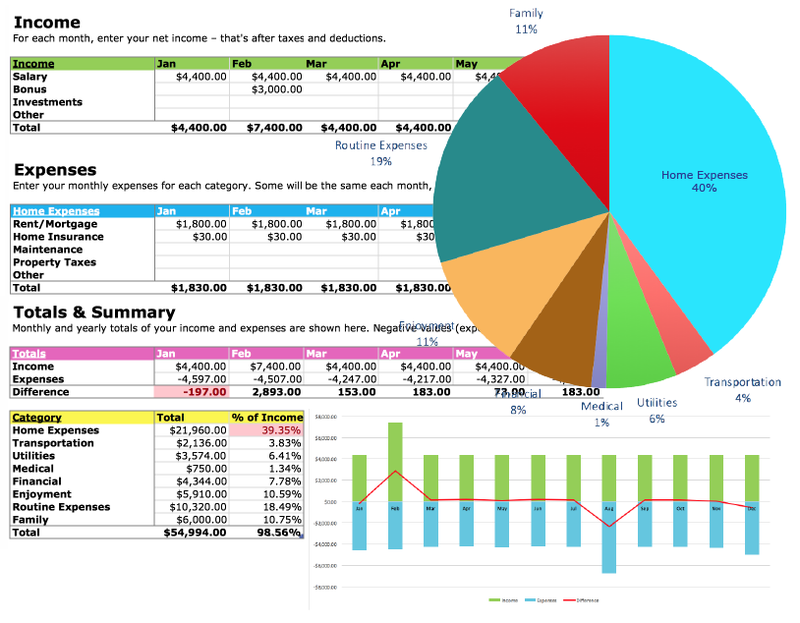 I found this site off a green blog and have been using it for the last week or so. Apparently plastic cards put 75 million pounds of toxic, carcinogenic polyvinyl chlorine into the waste stream. Not to mention the manufacture, shipping, packaging, and wrapping of something that is essentially a just digital code. My mom has this kids arts and crafts books that shows you how to make little boxes and gift bags from paper…. That’s what I’m using this year. I thought of making little christmas stockings out of bandanas also… but it’s too much work for all the ones I have to make. I also use brown paper bags, or an inexpensive roll of brown paper wrap. I take white hobby paint and a stippling brush, and stipple all over the package, as if it were snow. I also have some homemade star stencils – use an exacto knife and make star stencils out of paper plates. I stencil stars over the snow (using a metallic blue hobby paint over white snow paint is really gorgeous). A little creative writing of the recipients name in a colorful marker, maybe a recycled bow (can even be inexpensive raffia tied in a bow and taped on the package) – and you’ve got yourself tailor made gift wrap. It’s actually a lot of fun to do! Everyone seems to really enjoy their special gift wrap, and inside are just little homemade items like jams & baked goods, etc. Every year, my neighborhood has a “green” wrapping party. They have many of the previous things mentioned, like maps and parcel paper, but also things like blueprints (from an architect or building site), and movie posters. I love using maps, personally. Since I got a GPS device a couple of years ago, I don’t need my outdated atlas. I have used it to wrap gifts and also for several origami projects. My roommate knits a lot, and does other crafting projects, so for her Christmas present, I bought her a skein of yarn and a few crafty trinkets (beads, fabric paint, etc.). I wrapped the trinkets in the yarn by rolling it into a yarn ball around the little stuff. I’m pretty excited about making her unroll the ball and have all the fun stuff fall out! BTW if you try this, you want to make a sort of core out of the bigger items you have before wrapping the yarn around it. Smaller things can be worked in as you wrap. There’s yet another way, and it’s called furoshiki. Economical and earth/environmetal friendly too. You don’t need a special cloth to use this method, as any cloth will do too. I had a end of roll of butchers paper, got some potatoes and made x-mas tree, bell, star and santa hat shapes and used a tiny amount of acrylic paint i had laying around (red and green) and stamped it nearly to oblivion. it looks RAD. I also used a bunch of boxes I have been saving from cereal boxes etc, cut them up smallish and put one potato stamp on each one (actually my 6yo did this) then hole punch then a bit of twine. VOILA. Gift tags. Also looked RAD. There is also Furoshiki, which is a Japanese way of wrapping objects in squares of cloth without needing to tie it- it’s like wrapping [paper] origami! 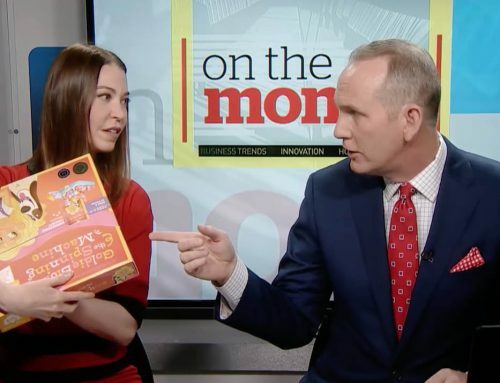 Thanks for getting the word out about all the cool ways you can wrap sans traditional wrapping paper. My family has been doing this (alternative wrapping techniques) for as long as I can remember, so I am happy it is catching on with others! We have a large roll of plain white paper that we use for art projects with our daughters, and I like to let the girls color, paint, or stamp whatever they want on the paper before I wrap a gift. This goes over big with the grandparents! The cutest reusable bags I’ve seen are actually at Toys R Us. They even have winter and Christmas-themed reusable bags! My biggest pet peeve has always been the brand names covering the reusable bags, but these only have the brand on the side in smaller print. cut a few potatoes in half, carve shapes into the halves, and dip them in paint and press onto the tissue, making your own personalized wrapping. If I get gifts in wrapped in gift wrap, I put the used paper through my shredder. You can then use it for filling in a gift basket, or filler in a bag. I used some of it this year in the packages I sent in the mail. It worked great as a buffer for the smaller packages in the box. I enjoy the other ideas I’ve seen listed. Great ideas for birthdays, etc. also! I use the pretty pink “Red Rosin” paper left over from our hardwood floor installations. I feel incredibly frugal when I do this! As kids, my mom would give me and my brother the black and white comics from the newspaper and we would color them in and use them as wrapping paper. It’s a great way to reuse that newspaper and allow the kiddos to make something one-of-a-kind. I like to use regular printer paper and take a little paper puncher in an seasonal design (I keep a snowflake and a heart around- one or the other usually will do) and punch occasional holes in it (works best on small presents, obviously…) and wrap a boxed present in that. The holes are small enough that the identity is not revealed, but adds a bit of color to the package. Obviously you could use any sort of paper for this. This year I bought paper… but next year I am planning on using old magazine paper to wrap my gifts. These are all great ideas. I have a large package that needs to be wrapped and I searched for ways to do it without wrapping paper. I think I’m going to have to use the tissue route but all the other ideas will help in the future when I’m not in a rush. Thanks! I like giving themed baskets. I gave a kitchen basket and used the tea towels as wrapping. I even re-used the ribbon that was holding the tea towels together in the store for a pretty bow. Small white garbage bags make excellent overwrap for baskets and small gifts. You can embellish the plain white bage however you like. The bonus is you use the bag to clean up after the party! I use towels, as they can purchased cheaply at the dollar stores and who doesn’t like getting new towels? Kitchen ones for small items, bath towels for larger, they come in many great colors, too. Just match your ribbon and voila! Also, as mentioned, about shopping at yard sales, I look for table clothes to use or blankets in good shape, throws, etc…My sister even uses clothes, such as sweaters to wrap in (2 gifts for the price of one!) 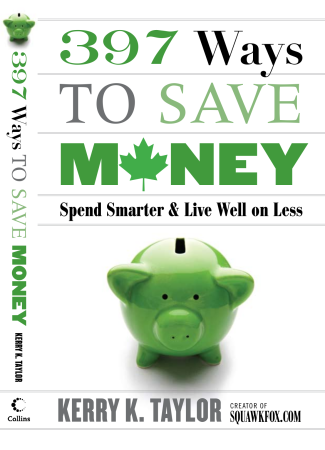 If you keep your eyes and mind open, there are many good ways to reuse, recycle and re-gift! Love this site! Love your newsletters, too. I was just thinking of sewing random scraps of material into a bag and closing it with ribbon for the wine I’m giving as gifts, similar to what @Monica said. Thanks for the inspiration to actually do so! Going out and buying a wine bag just seems so wasteful. One year my friend asked that we consider giving her children clothes for presents as they needed them far mora than new toys. Not as much fun for the godmother, so I compromised. Fun toys were wrapped within the shirts and pants. The kids loved opening their presents, Mom appreciated the clothes, and the kids and I enjoyed the new toys! Old calendars make great gift wrapping paper, if you use the pictures. And you can recycle last year’s calendar at the same time. I love the jewel box. It looks like a mini treasure chest! Wonderful Ideas…………I have used many over the years.I like to make theme baskets, and cover them with cellophane any color. Seems the Christmas bags are a big hit also. We all seem to appreciate them and re-cycle them. 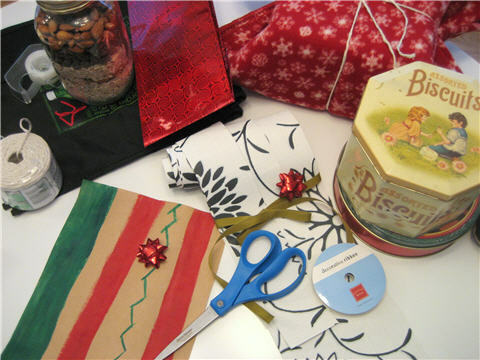 You can sew up some cute gift bags that are reusable as grocery shopping bags. You could even use an old pillow case for that. I love using gift tins because they can be reused in so many ways. I tried something new this year. I have 100+ white paper bags from Costco, put your gift inside, fold down the top, punch 2 holes, put ribbon through the holes & tied a bow with a candy cane. 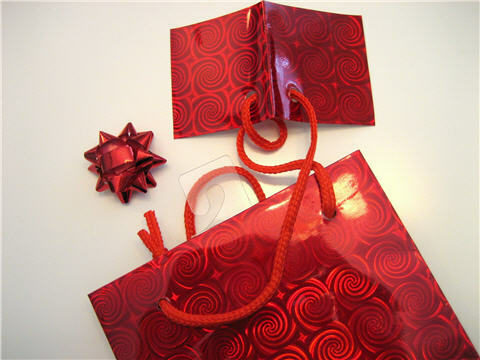 If I am buying a gift in a store that has its own nice bags, I make sure I get one and then place the gift in that bag, add a ribbon or a bow and voilà. I used to live in Europe. In many shops there, they will ask if your purchase is a gift and then do the wrapping on the spot…and make it look classy too. A real time-saver and good customer service. Great ideas! I like the baby gift in swaddling clothes and the wrappings made of cloth. Don’t forget newspapers and magazines as sources of paper, too. I pull an interesting page out of a magazine and wrap my smaller gifts with that. In the old days I used to use the “funny pages” out of the Sunday paper. If you don’t get any newspapers, you still get those direct mail pieces. Wrap a food gift in a Safeway or other grocery announcement. Endless possibilities. I was at a shop in Phoenix this weekend called “Tuesday Morning.” They are liquidators that carry a lot of wonderful things at deep discounts. They had some of those little foldable shopping bags made of recycled plastic. These fold up to the size of a deck of cards and fit in your purse, but can hold as much as a regular paper grocery bag. So I bought several and used them to wrap some of my gifts. Another more ambitious way is to make your own paper. Take all those advertising flyers, old newspapers, and mail you want to shred, and put it through your cross shredder. Now you have the beginnings of pulp. Type in “make your own paper” into your search engine and you’ll find many wonderful resources for making various types of paper. 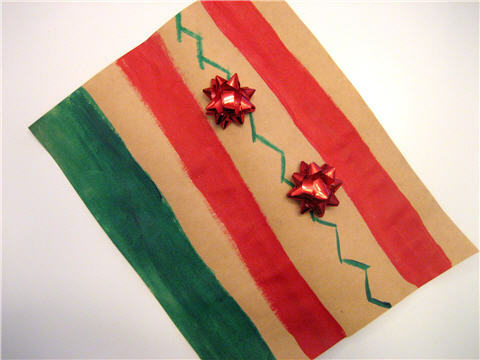 Not only can you make wrapping paper, you can make scrapbook paper and writing paper. It’s a fun and creative way to recycle. 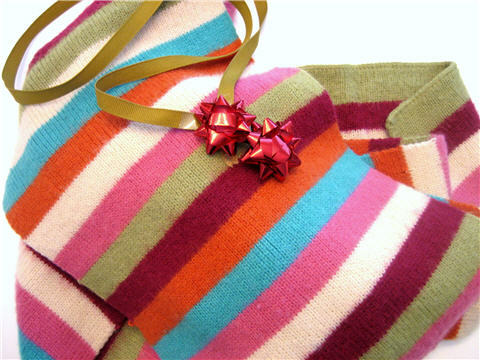 A pair of socks with a Christmas theme makes a great wrap for a bottle of wine. Put the bottle in one and tie the other around the neck of the bottle like a scarf. Voila! As mentioned in with other comments, I used tea towels alot and hand towels to wrap gifts. I also save our daughter’s art work through out the year and wrap prezzies with them (she comes home with so much from preschool!). Also, I re-use gift bags, and make my own cards. (Also, I don’t write in my cards, I just use post-its, and then the card can be enjoyed this season and re-gifted next). I put my handmade cards in a clear envelope – along with a white envelope and adhere the card to the outside of the plain gift bag – so it dresses it up quite nicely! Like everybody else pointed out, you forgot the best way of them all… FUROSHIKI!!!! I haven’t bought wrapping paper for years and have used most of the above mentioned ideas. This idea is for children’s birthday party loot bags. Use the coloured clear plastic newspaper bags. They are usually pink or blue which is fun. The kids can see through them, so they don’t feel the need to unwrap their goodies on the spot either!! You can cut them down to appropriate size, even tie in a knot or add some ribbon. The kids always loved these loot bags because they were different and free for me….always a bonus! in the UK you can get free wall paper samples from many diy stores….I haven’t bought wrapping paper in years! Enjoyed reading all the neat ideas for wrapping gifts. Just wanted to share a couple of mine. One year I saved cereal boxes, painted them with acrylic paint and made different designs using sponges,scrunched paper and different colors of paint to decorate the boxes. These were well received and even reused by the recipients the next year. This year I decided to use old pillow cases. They hold almost any shape or size of gifts. Just tie at the top with a ribbon and attach a name tag to ribbon. Very quick and simple and no mess of wrapping paper to dispose of and the grandchildren loved being able to carry their own “sack” of goodies home themselves. We went on a 3 mth trip across USA (to celebrate our early retirement)… We learned on that trip, there is “no place like home!” I also had a drawer full of old paper maps that needed cleaning out when we got home… not wanting to just throw the lovely maps into the recycle bin… For Xmas the year after our trip, I “themed” Our Xmas, No-Place-Like-Home. I wrapped ALL of our presents in old paper maps. And made a cute little ‘ornament’ as a package tag announcing “No Place Like Home”. Used Green and Red ribbon to get a little bit more traditional feel. (I still have lots of maps… and will continue to wrap presents (as appropriate) in them until they have found new life before the recycle bin. I am giving the children at Children Church hats & gloves for Christmas. I am trying to think of a creative way to present the itmes to them without wrapping them in gift wrap paper. Help!!! @Pamela, one year I gave gloves. I put one glove inside the other, put a small gift card inside, looped some ribbon and a jinglebell at the top to make a loop, so they could be hung like christmas stockings. You might be able to put the gloves inside the hat (hat open side upward) and use some ribbon to make a hanger and hand the filled hat like a stocking? This year I packaged all my presents to look like USPS packages. I reused brown craft paper and brown shipping boxes. Made “fake” shipping labels, printed them from my own printer on plain white paper and cut them out with fisker sissors that made the edges look like ‘stamps’. Attached the labels with a glue stick. The return label being who the package is FROM:, and the words “Deliver to:” with the recipients name. Found some old kite string in the garage and tied that around. When I was a kid, this is how my parents prepared packages for USPS–brown craft paper and string. Check out the pic in the website link.